When we say these are XXXTRA HOT, we mean it! From the first bite, there is a nice bar-b-q taste with heat that slowly builds until your mouth is on fire! 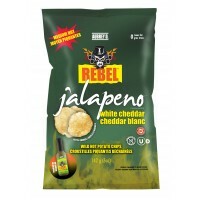 The burning sensation feels really great and lingers as you crave more of the delicious bar-b-q and habanero flavour. One thick kettle cooked chip will have you running around the room in tears looking for a drink to quell that awesome heat so you can enjoy even more pain!